Petra Kvitova, who was severely injured in a 2016 knife attack, today reached her first Grand Slam final since 2014. Seeded eighth, Kvitova outslugged unseeded Danielle Collins of St. Petersburg, Fla., 7-6 (2), 6-0 and became the first Czech woman to advance to the Australian Open final since Jana Novotna lost to Monica Seles in 1991. The roof on Rod Laver Arena in Melbourne was closed at 4-4 in the first set because of 104-degree (40.0 Celsius) heat. Kvitova, who captured the Sydney title two weeks ago, extended her winning streak to 11 matches. She has not lost a set in six Australian Open matches. Collins crushed second-seeded Angelique Kerber, who won the first of her three Grand Slam singles titles in the 2016 Australian Open, 6-0, 6-2 in the fourth round. Kvitova, the 2011 and 2014 Wimbledon champion, suffered career-threatening cuts to her left (playing) hand in the December 2016 attack at her home in the Czech Republic. In her only Northern California appearance, Kvitova reached the quarterfinals of the 2017 and last Bank of the West Classic at Stanford. Collins, a two-time NCAA singles champion from the University of Virginia, advanced to the quarterfinals of the 2017 Sacramento Challenger and the semifinals of last year's inaugural Mubadala Silicon Valley Classic in San Jose. Fourth-seeded Naomi Osaka of Japan prevented an all-Czech final, beating seventh-seeded Karolina Pliskova 6-2, 4-6, 6-4. Pliskova ousted Serena Williams in the quarterfinals, overcoming a 5-1 deficit in the third set and saving four match points. Williams rolled her left ankle on the first match point. 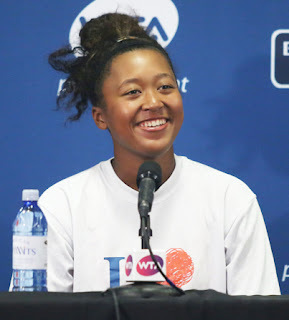 Osaka, 21, will seek her second consecutive Grand Slam singles title when she meets Kvitova for the first time on Saturday at 12:30 a.m. California time (ESPN). Osaka's first big win came in the 2014 Bank of the West Classic. As a 16-year-old qualifier playing her first main-draw match on the WTA tour, Osaka saved a match point and ousted 2011 U.S. Open champion Samantha Stosur. Pliskova reached the Stanford final the following year, losing to Kerber. Second-seeded Rafael Nadal, the 2009 Australian Open champion and a three-time runner-up in Melbourne, outclassed 14th-seeded Stefanos Tsitsipas, a 20-year-old Greek, 6-2, 6-4, 6-0 in a men's semifinal. "It felt like a different dimension of tennis completely," Tsitsipas told reporters. "He gives you no rhythm. He plays just a different game style than the rest of the players. He has this, I don't know, talent that no other player has. I've never seen a player have this. He makes you play bad." Nadal will face either top-ranked Novak Djokovic, a six-time Australian Open champion, or 28th-seeded Lucas Pouille of France for the title on Sunday at 12:30 a.m. (ESPN). In the men's doubles semifinals, fifth-seeded Pierre-Hugues Herbert and Nicolas Mahut of France outclassed unseeded Ryan Harrison of Austin, Texas, and Sam Querrey, a 31-year-old San Francisco native, 6-4, 6-2. Herbert and Mahut, who are trying to complete a career Grand Slam in men's doubles, will meet 12th seeds and 2017 champions Henri Kontinen of Finland and John Peers of Australia for the title.